UNT’s academic and creative opportunities breed friendships and innovative partnerships. Gene Pflug ('51) reflects on 'Fessor Graham's influence on his early tap dancing career. New strategic plan will help UNT rise to the top. Groundbreaking research earns UNT a national reputation in plant science. UNT unveiled its four bold goals Feb. 13 with its new five-year strategic plan and theme line. UNT continues to make strides in innovative research, scholarship and creativity. A community of high-achieving scholars goes above and beyond. Alumnus Rich Emberlin, Dallas police detective and reality TV celebrity, remembers his UNT roots. UNT unveils new strategic plan and theme line. For the Hill family, graduation proved to be a family affair. Former music student reflects on her faculty members. TAMS student Kurtis Carsch was named one of 40 finalists in the 2012 Intel Science Talent Search. As 2012 Texas Poet Laureate, Jan Seale (ʼ69 M.A.) shares gift with others. Alum shares photo from days as a Concert Band student. St. Louis-based artist Jill Downen creates installation at the UNT Art Gallery. Alums receive $2,500 Educational Administration Scholarships. Faculty, staff and alumni change lives through institute. UNT hosts second annual Senior Barbecue Picnic at the Alumni Center. Business Leadership Building becomes third LEED certified building on campus. UNT alumnus Spike Johnson named 2011 College Photographer of the Year award. Chemistry and Materials Science and Engineering professor Francis D’Souza receives grant. UNT brings cultural and intellectual opportunities to students and community members. The impact of Calvinism is examined by Milan Zafirovski, professor of sociology. Alum remembers Dean O.J. Curry's Business Problems and Trends M.B.A. class. Daniel Garcia (’08) is the voice of Zane in the 3-D DirectTV cartoon Dream Defenders. Celebrated magician Paul Osborne (’70) worked his way through college doing magic shows. Two alumni had a role in Oscar- and Grammy-winning projects this year. 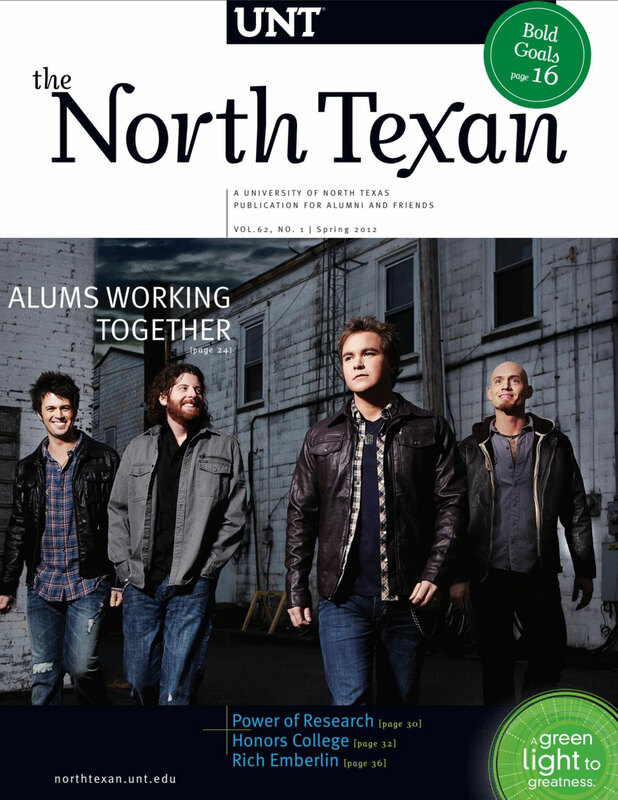 Tait Cruse (’89) credits UNT for successes. Today, he’s giving back to UNT. Mean Green basketball makes big with tournament play. Texas' winningest high school football coach receives honors. Arminta Jacobson was named a fellow by the National Council on Family Relations.